A private care home at the centre of an investigation into the deaths of six patients has been shut. Elderly residents at Briars Retirement Home in Thorold Road, Bitterne Park, Southampton, were moved out on Friday. A court order was obtained by the Commission for Social Care Inspection (CSCI) which claimed the welfare of the residents was "at serious risk". Police raided the home on 17 September following allegations of neglect. Owner Annette Hopkins has denied the claims. Ronald Reed, 81, who died in August, is one of the cases being investigated. He died at Southampton General Hospital on 9 August. 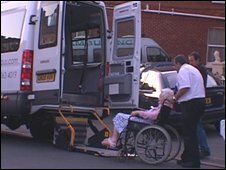 The court order cancels the registration of the care home, meaning it can no longer legally operate. The CSCI said inspectors visited the home in light of the police raid and found some of the residents needed urgent nursing care. Amanda Sherlock, CSCI's regional director for the South East, said: "The commission seeks an urgent cancellation order only when it considers people to be at serious risk. "We could not allow this to continue." The residents have been moved to other homes while the investigation continues. Many still support the home and were shocked by the closure. Adrian Lewis, whose mother has been at the home for eight years, said: "It was horrendous, the worst day of my life. "They were absolutely marvellous to her. They've taken her home away from her." The city council said it had a team of staff to help residents move to other accommodation.